The Fountain of Youth. The Mecca of flavor. 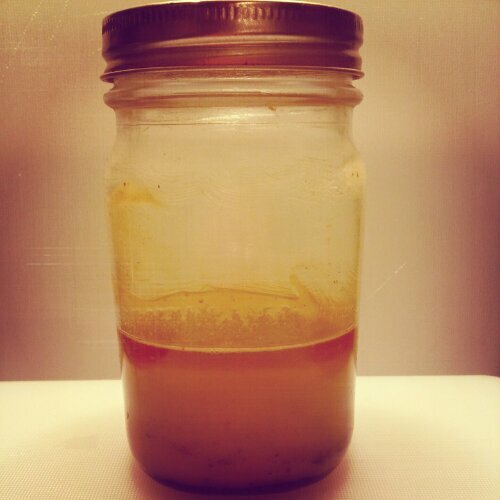 King Midas’ liquid gold … BACON GREASE! I realize some people find this gross. I find some people gross. Please, please, please, I implore you: save and reuse your bacon grease! This is flavor gold. Drain the hot grease right into a jar if you’d like (or, ahem, a tin can). Scrape out the crunchy black bits from the pan and drop those in there, too. And don’t just leave it there. Reuse it! Or send it to me, and I’ll reuse it. WHY TO REUSE BACON GREASE? It’s the next best thing to bacon. Fanfreakingtastically good. Tastebud paradise. It will save you money because you will buy less butter and other cooking oils. Reusing things is “green” and all that jazz. Because there’s no good way to dispose of it, except in your bel-ly. Ex-nay on dumping it down the drain, running it through the disposal, or throwing it in the trash. Those are not ideal options, unless maybe you live in an apartment, don’t pay utility service fees, and hate your landlord. It’s not as bad for you as you think. It’s much better for you than other processed and/or hydrogenated oils. Your grandma would be proud and pinch your cheek. Because you can experience all the yum of bacon without actually buying and cooking it. The $4-$9 you spent on that package that disappeared before you got any goes a lot farther. Sometimes you need to sneak bacon flavor into things (sans the actual crispy pieces). Replace butter/oil with it in most recipes. FACT: It can be slathered on…pretty much anything. Love the word “fat-phobiacs”…check out my cooking blog…I use bacon, bacon grease and butter in many recipes! Our bodies need fat! Red beans and rice isn’t the same without bacon grease. Ohh, gotta keep my bacon grease! I don’t eat those lovely little strips of heaven nearly as often as you seem to, but there’s always that little jar at the back of the fridge. how long can you keep it in the fridge? Use it to pop popcorn. Your blog is funny. Enjoyed reading it. This is what I wanted to hear! Let allllll the Keto dieters know however you can!